YOU GUYS. We must discuss this one pot pasta. YES. One pot. Everything can be made in one pot. It’s delicious. Unreal. If I told you how many times I’ve made this over the last six months? You won’t even believe me. It might come in there around 20. 20 freaking times. Isn’t that nuts?! Also. Huge news: Eddie doesn’t love this. I can’t even believe it, because it is SO good. This was only one of my two cravings during pregnancy after I made it for the first time. The second craving was a Pittsburgh-style salad with French fries on it (ew gross or amazing?). And the love for this has stayed put. 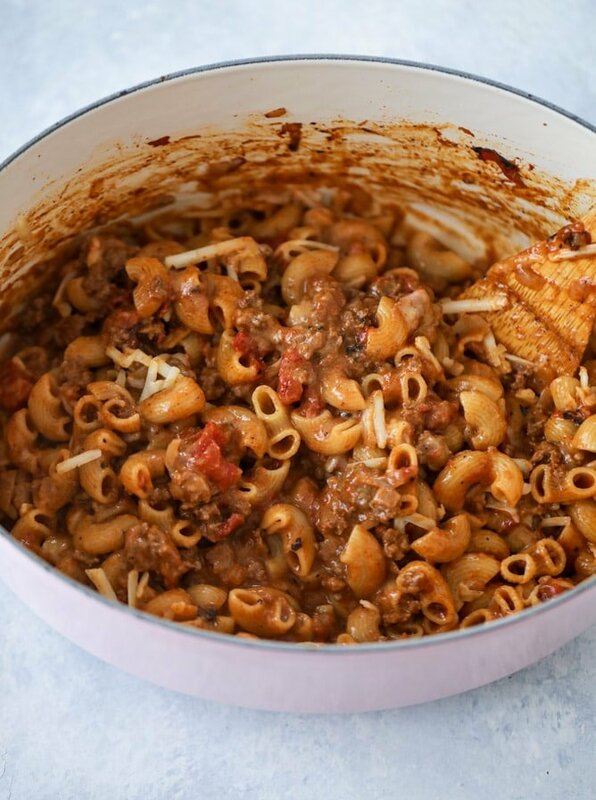 I started making a version of this while pregnant – Amy’s easy chili mac. Before that, I probably wouldn’t have even been interested in a recipe like this. Pregnancy does weird things to you. And it was so good… but I realized that I could do without the beans AND pasta (even though I do love beans in chili) and then eventually, wondered if everything could be made in ONE pot. But anyhooooo, back to why Eddie doesn’t like this. It’s not that he doesn’t LIKE this. He does LIKE it. He thinks it’s okay. I’m just being dramatic. But it’s really all my own fault why he’s not bananas over it like I am. When I first made it months ago, I texted him and said that I had made a chili pasta for dinner. He took that to mean that I made chili AND pasta… and he thought he was going to be able to spoon chili OVER his pasta. And that was that. Ever since? He can’t get into this one pot pasta. It’s not what he calls “chili pasta.” So the whole recipe is ruined (ruined!) for him. For the record, chili over pasta is just… okay in my eyes. I find it almost bland, so the only way you’d even find me eating something like that is with copious amounts of cheese stirred in. Sort of like this! Also, during a very low moment of my life (like two weeks ago when I was sleep deprived), I didn’t eat this like a normal person. I SCOOPED IT OUT OF THE BOWL WITH TORTILLA CHIPS. I have wanted to make another one pot pasta for AGES. I made this mushroom swiss chard version back when Max was born and it is a true favorite. I’m still amazed that you can toss all this junk (especially the dry pasta!) in a pot and have it come out as an actual meal. Whaaaaat. It’s just mind blowing. It’s truly the ultimate comfort food. I adore it. It doesn’t take very long and it’s super flavorful. I also usually use whole wheat elbow noodles but I had these cute macaroni noodles from Trader Joe’s leftover from Christmas. Fun to make too! Take a peek at my video for one pot chili pasta! 8 ounces elbow noodles I like whole wheat ones! Heat a large pot over medium-low heat and add the olive oil. Stir in the onion, garlic, salt and pepper. Cook until the onions soften, about 5 minutes. Add the ground beef, breaking it apart with a wooden spoon. Cook, stirring often, until the beef is browned, about 6 to 8 minutes. At this time I like to keep breaking the beef apart. I also occasionally increase the heat in order to cook off some of the fat from the beef. Once the beef is browned, stir in the tomato paste, chili powder, paprika and cumin. Cook for another 5 minutes, stirring often. Pour in the tomatoes, green chiles and stock (or water). Add in the pasta. Bring the mixture to a simmer, then cover the pot and cook for 10 to 15 minutes, stirring occasionally. The pasta should absorb all the liquid and plump up! You don't want the heat too high, because the pasta can stick on the bottom. If it needs a few more minutes, keep the pot covered. Once the pasta is cooked and the liquid has been absorbed, stir in the cheddar cheese. Taste and season additionally if needed. Serve immediately with sliced green onions and if you're really feeling it, sour cream for serving. 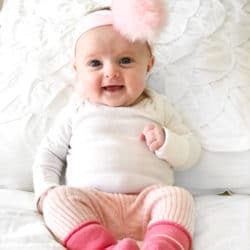 life with emilia: ten weeks in. This sounds SO good. I love the one pot pan method. I so rarely get to do it!. BTW, pasta nachos sounds awesome. It should be the next big thing. Plus aren’t you supposed to have tortilla chips with chili?! Plus ALL the cheese please. Can’t wait to try it. I was wondering how well this recipe keeps? Could leftovers be served throughout throughout the week or does it become too stodgy? Thanks in advance. You’re only a liiiiiiiiitle bit busy ;) Mom brain is real!!!! hahaha thank you for understanding! I made this the other night….SO GOOD! Cannot wait to make it again and include the green chilies I forgot. YUM!! love that! i hope you try it! OOOhh, I’m in my first trimester currently and nothing sounds good, but this sounds good! Going to try it this weekend! Thanks! This sounds SO good! I totally agree that chili Mac w/beans is just too much. My husband is the same way- if something isn’t the way he thinks it will be when I tell him about it he’s not fully into it. Men are so weird! This looks amazing! I am definitely adding it to the list. It also reminds me of the other Amy’s Chili Mac (which I keep in the work freezer for emergencies). oh i’ve never tried that! i used to love amy’s freezer burritos and have been meaning to grab a few! Yes! I’m all about the one pot pastas! The flavor of the noodles is so much better. I’m with you on pasta nachos! I also love to just crumble up chips and put them on top of something like this. This is a childhood favorite!!! Yum! Also, my family doesnt go for this sort of thing either! Weirdos!! Cincinnati chili- such as Skyline chili over pasta- is anything but bland- try it! Very different with deep earthy flavors heavy on the allspice…. 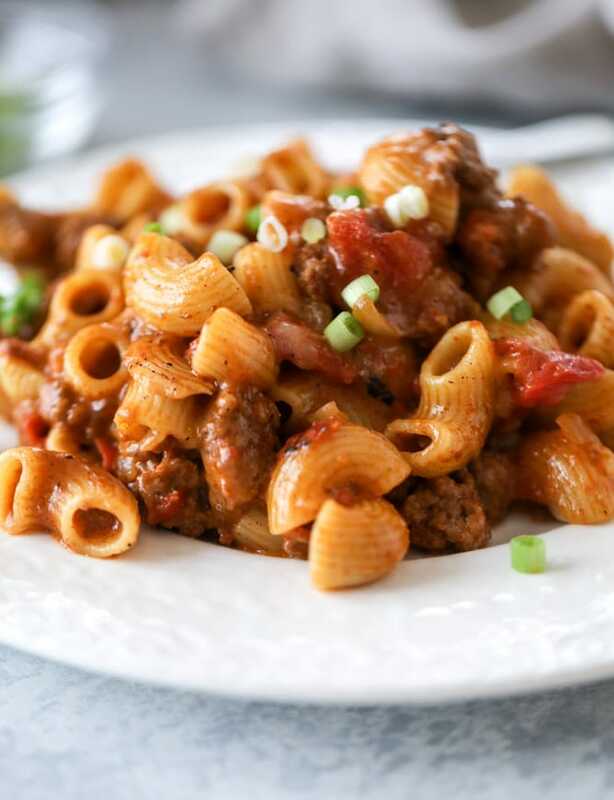 I am from New Orleans -chili never went on top of pasta but….. it really does work and when you have the combo- topped with cheese and onions (skip the beans- or not) and sometimes sour cream- you will not say bland to chili on pasta!! I think Eddie might like it too!!! This pasta dish is interesting and healthy. Yum! Reminds me of my mom’s goulash recipe.. sans the green chili’s! Both my kids devoured this dish. Which NEVER happens with a 3 and 1 year old. Thanks!! Just made this. So quick; thanks for sharing! I made this last night and it is delicious! I have leftovers for lunch today and tomorrow! Yum! I made this last night and the whole family loved. Was delicious! Delicious! I accidentally added an extra tablespoon of chili powder but my husband and I both thought it was really tasty. I will definitely make again! It’s like the One-Pan Enchilada Pasta from No. 2 Pencil that I fell in love with years ago. Piled with green onions, olives, avocado chunks and sour cream. It’s just so hearty and good! Can’t wait to try this! Hi Jessica – Can you provide the nutritional details for this dish? I made this the other night and it was absolutely delicious!! My husband loved it. The flavors, the textures, everything was incredible. I’m having the leftovers tonight, so any advice on reheating is appreciated! Thanks so much for sharing such a delicious (and easyyyyy) meal! One of your best recipes ever! I was able to speed cook it in just over 30 minutes (while feeding a toddler), turned out perfect, barely any dishes. Thank you for providing amazing, quick meals! We love this recipe! I have made a vegetarian version with black beans also. I leave out the smoked paprika and green chiles to make it more friendly for my toddler. Sometimes will add a drained/rinsed can of Ro-Tel instead. You had me at one pot, those are the best kind of meals. One pot dinners are the best! This is so easy and so good for busy weeknights. The perfect dinner for me and my husband tonight! Thanks for this recipe. This is basically a flavor AND comfort explosion in one. Love! The best weeknight dinner- yum! I could eat this everyday and never get tired of it. I haven’t had this in so long! You just brought back a lot of great memories. I happened to have everything to make this the other night…however I didn’t have enough ‘regular’ pasta. So I decided to use up some random veggie pasta and red lentil pasta (Trader Joe’s). Basically, I made a healthy version, subbing ground turkey for ground beef. It was quite delish! I stumbled upon this recipe on your blog, and thought it would be a perfect dish for our weather here in the U.P. of Michigan. We’ve had a glorious summer, 4 months of warm, sunniness (?) but it suddenly is definitely fall, with 34 degrees this morning. Hence the search for comfort food. And boy, is this comfort food! Favorite for sure. Used a block of Black Creek Cheddar with notes of Gruyere. Nailed it!